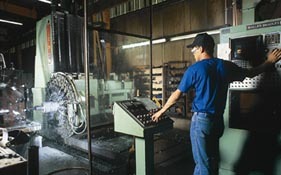 Horizontal CNC Mill, Kearns Richards 48” x 72” rotary table 3 axis control 4” spindle. Cincinnati Duplex Milling Machine 80” bed travel. Tool Capacity 120. Max part 2000 mm x 1550 mm. Spindle Speed 0-6000 RPM. Spindle Drive 50 HP.